Little known fact but today is a national holiday.......at least for your eyes. June 27th has been deemed National Sunglasses Day, and if you didn't already do so every single time you step outdoors, it is time to rethink the importance of donning a pair. Sunglasses truly do deserve a day of their own; they may be the ultimate medical device ever created-- so fashionable and street smart we even forget that they are protecting us sometimes. Why Should Everyone Wear Sunglasses? We all know that sun-burnt skin carries an increased risk for skin cancers, and sun damage to the eye is no less dangerous. The truly scary thing about ocular sun damage is that it can cause serious vision and health issues decades later. In fact, studies report that as much as 80% of our lifetime ocular sun damage occurs by age 18. That means protecting ourselves at an early age is extremely important when we reach our 60s and 70s, when medical conditions like macular degeneration, cataracts, and cancers are more likely to begin developing. 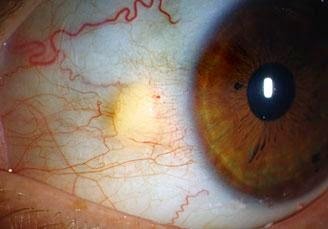 You can learn more here about all of the ocular medical issues that sun damage can cause. We should all protect ourselves right now to prevent problems later, and with sunglasses it is never too young to start. 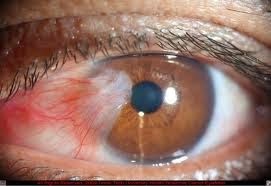 pterygium (below) which can cause serious visual issues. If I haven't convinced you yet of the medical need for sunglasses, don't you want to look younger? Have you ever noticed that as we age our eyes tend to yellow and discolor, and of course wrinkles develop around the eyelid skin. The aging process and the appearance we associate with it is really exacerbated by sun damage. In addition to UV exposure being a major health and eye disease risk, it also causes some very common changes to the ocular surface that can be cosmetically disturbing to patients. I often have patients ask me in the exam room how they can make their eyes look brighter and whiter (and younger). Sunglasses are essential to keeping the conjunctiva (a vascular tissue that lies over the white of the eye) clear and un-inflamed. Sun damage quite commonly causes thickening and hardening of this vascular layer and the result is often pinguecula or even more aggressive ptergyia growths on the eye. These conditions are irreversible, and once these growths develop they cannot be removed without surgery (and unfortunately they tend to grow back). If you have chronic dryness issues, sun damage can be a major factor for why your eyes looks so chronically red and irritated. Growths on the eye from excessive sun exposure are one of the first places that will dry out with computer use or in dry environments, making your eyes red, dry, and even watery. Growths like pinguecula don't start forming just when we are older -- they are a result of sun damage that occurred when we were children or teenagers in most cases. Protecting the eyes from childhood can prevent these growths and the dryness and irritation that can cause, but it is never too late to start wearing sunglasses now. You can't reverse the damage you have already suffered, but you can keep it from getting even worse. Want a new pair of sunglasses? Luckily my good friend and fellow blogger Dr. Glover at Eye See Euphoria is raffling off 2 great pair of sunglasses today. Enter now for a chance to win a free pair of 100% UV blocking protection, with a lot of style thrown in for good measure -- just what we want in our favorite pair of sunglasses. Click the picture of the pair you prefer to link to his site and enter for the giveaway.